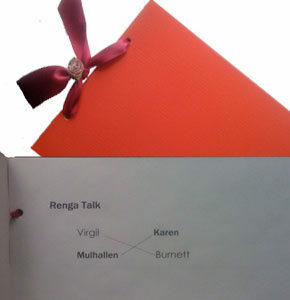 Renga Talk is a poetic correspondence carried on by artist Virgil Burnett and writer Karen Mulhallen over ten years. The dialogues are crafted in the form of the Japanese renga which consists of either 50 or 100 tankas. 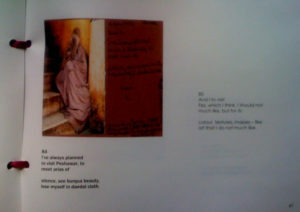 In effect what this book has created is a ten year conversation played out as a game with increasing stakes, using images as well as words to converse. The final form has been printed as a limited edition book, each copy hand bound, and the whole run limited to 12 copies, with additional copies being created only on demand.